​John Ketcham was born August 09, 1622 in Cambridge, England; christened 8 Sep 1622 at St. Andrews Church, Cambridge, England. He married Susan Payne, daughter of William Payne, circa 1646; he and Bethiah Richardson obtained a marriage license 26 Feb 1676/77 at New York. He married Bethiah Richardson, daughter of John Richardson and Martha Mead, 14 Mar 1676/77 at West Farms, Westchester Co, New York. John died 17 May 1697 at Newtown, Queens Co, New York, at age 73. Bethiah died in 1652 in Newtown, Queens, Long Island, New York. On 17 May 1697 John Ketcham's will was probated; letters of administration granted to John's widow, Bethiah. He immigrated to Ipswich, Massachusetts Bay Colony, England. He was "made free at the 2d Session of Salem Cort, the 28: 12 m, 42" on 28 Feb 1642/43 at Salem, Massachusetts Bay Colony (Massachusetts). He resided where he purchased several utensils from auction sale of the estate of Michael Carthrick for 17s in 1646 at Ipswich, Massachusetts Bay Colony (Massachusetts). He resided possesses land adjoining on the west a grant to William Payne in 1647 at Ipswich, Massachusetts Bay Colony (Massachusetts). He resided subscribes to Major Denison's Compensation in 1648 at Ipswich, Massachusetts Bay Colony (Massachusetts). He was representative from Ipswich to the Massachusetts Bay General Court in 1648 at Boston, Massachusetts Bay Colony (Massachusetts). He immigrated before Jun 1653 to Hashamomack, Southold, Suffolk Co, New York. He resided purchased house and land for 20 pounds from Steven Goodyear of New Haven on 4 Jun 1653 at Hashamomuck, New York. He was appraiser of the estate of William Salmon (along with William Wells and Barnabus Wines Sr.) in 1657. He immigrated before 1659 to Setauket (Brookhaven), Suffolk Co, New York. He immigrated before 1 Dec 1659 to Setauket (Brookhaven), Suffolk Co, New York. He was at town meeting a "home lot" was made over to John "Chachum" on 1 Dec 1659 at Setauket (Brookhaven), Suffolk Co, New York. He was granted 6 acre lot in the "Old Field" and a 4 acre lot in Setauket in 1661 at Setauket (Brookhaven), Suffolk Co, New York. He was constable in 1661 at Setauket (Brookhaven), Suffolk Co, New York. He was "Action between William Alburtis pltf and John Citcham defendant. Defendant swears that 'hee to the best of his Memmory he never Gave John alburtis order to winter two swine that was Thomas Martens'" on 31 Jul 1663.69 He and Susan Payne were sold place to Thomas Moore, Sr on 29 Sep 1666 at Southold, New York. He immigrated in 1668 to Newtown, (Queens Co), New York. He was elected as Constable in Apr 1669 at Newtown, (Queens Co), New York. He immigrated on 23 Sep 1669 to Newtown, (Queens Co), New York. He was served as Overseer with Robert Field between Apr 1672 and Aug 1673 at Newtown, (Queens Co), New York. He witnessed England and Holland declare war in 1673. He witnessed Dutch capture New York on 30 Jul 1673 at New York, New York. He was along with John Burroughes, as representatives of the town of Newtown, presented themselves in the fort at New York to "the lords, conmmanders, and the noble military council" bearing the Engish colors and a constable's staff in token of the town's submission to the Dutch States General, and petitioned for the uninterrupted enjoyment of their privileges; they were told that they would be allowed the same immunities as subjects of the Dutch nation, and were directed to notify the town of "Middleburg" to nominate six persons, from whom the court would select three for magistrates, and also to appoint two deputies to unite with others of "Rustdorp, Heemstede, Vlissingen, and Oyster Bay," to present three nominees for the office of scout (or sheriff), and three for secretary, which latter officers were to have authority over these five named towns to be united in one jurisdiction on 22 Aug 1673 at New York, New York. He was selected by inhabitants as one of six persons (along with Gershom Moore, Richard Betts, jonathan Hazard, Ralph Hunt, and John Burroughes) from whom the Dutch court would select three as magistrates; the court selected Betts, Hazard, and Hunt, who were sworn into office 6 Sep 1673 on 24 Aug 1673 at Newtown, (Queens Co), New York. He was served as Overseer with Robert Field between Nov 1674 and 1675 at Newtown, (Queens Co), New York. He was elected as town clerk in 1675 at Newtown, (Queens Co), New York. He witnessed the death of Susan Payne before 1676 at Newtown, Queens Co, New York. He was Thomas Stevenson v. John Ketcham, action to recover damages to Stevenson's horse between 5 Jun 1677 and 6 Jun 1677. 4. 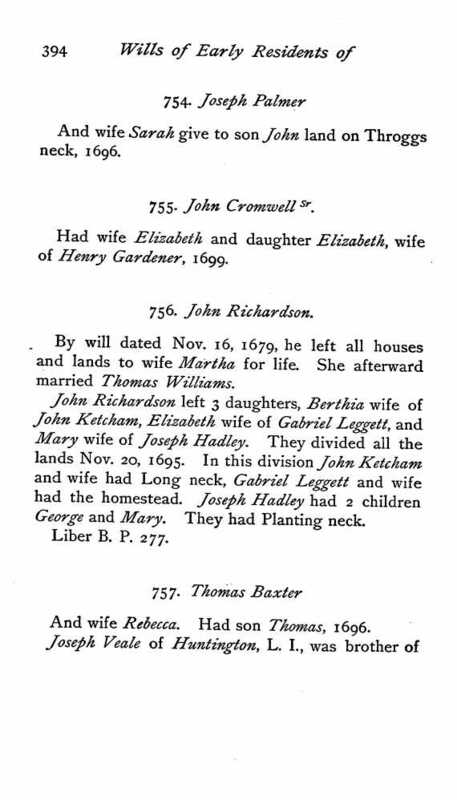 Joseph Ketcham, born circa 1685 at Newtown, Suffolk Co, New York; married Martha Phillips.